Here at ShiftingLanes we love Hot Hatchbacks. As we’ve stated before, no other car combines fun, practicality and fun like Hot Hatches. And Ford (who’s rather on fire lately with their performance cars, GT350, GT) has just revealed the newest and potentially hottest of them all. 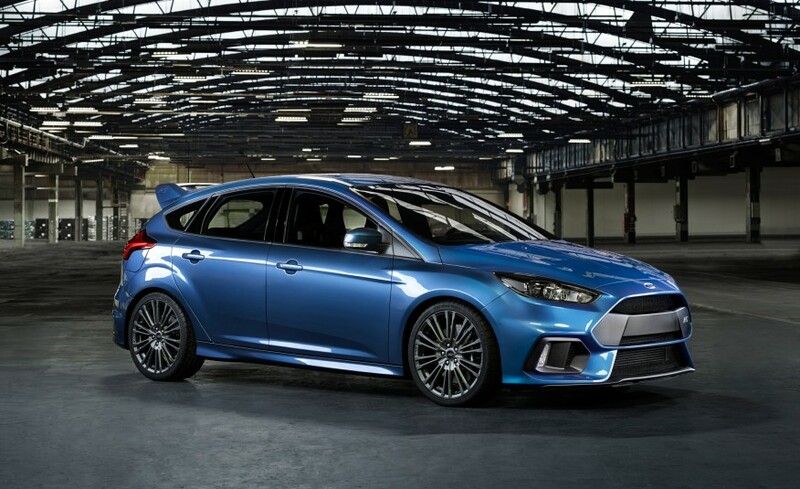 6 Speed Manual, All Wheel Drive and, according to Ford “well in excess of 315 Horsepower,” Ladies and Gentlemen, meet the brand new 2016 Ford Focus RS. The New RS is powered by the same 2.3 turbocharged 4 banger as the new Mustang. Yes, a turbo 4 from a Mustang, and its good, really good. The RS will have slightly bigger turbo, intercooler and unique exhaust system. Ford is being coy with the performance figures but promise power well north of 315. We’ve heard rumors of around 350. Think 0-60 in the mid to low 4’s and a top speed around 155. Stay tuned for the official figures. The absolute best feature of the engine in the RS is the transmission. There is only one option, and if you’ve been paying attention you’ll know what that option is. Yes sir, the RS will come with a 6 speed manual, only. If you don’t know how to drive a manual you are incomplete as a human person. Seriously, go learn right now. All of this tremendousness is attached to All Wheel Drive. Oh yes, unlike its predecessors the RS will send power to all 4 wheels. Good bye torque steer, hello 2 electronically controlled clutch packs and torque vectoring. The RS AWD system is capable of sending up to 70% of its power to the rear axle. Front to back, side to side allow the RS to be chucked around and based on the teaser video it can get quite sideways. Ever since I’ve been legally able to drive, Ford has owned the market on small car handling. It all started with the original focus and I see no reason why it shouldn’t continue with the RS. Bushings, springs and anti-roll bars are similar to those found in the Focus ST. Though considerably stiffened for their work in the RS. Also featured, 2 stage dampers and retuned electric steering. 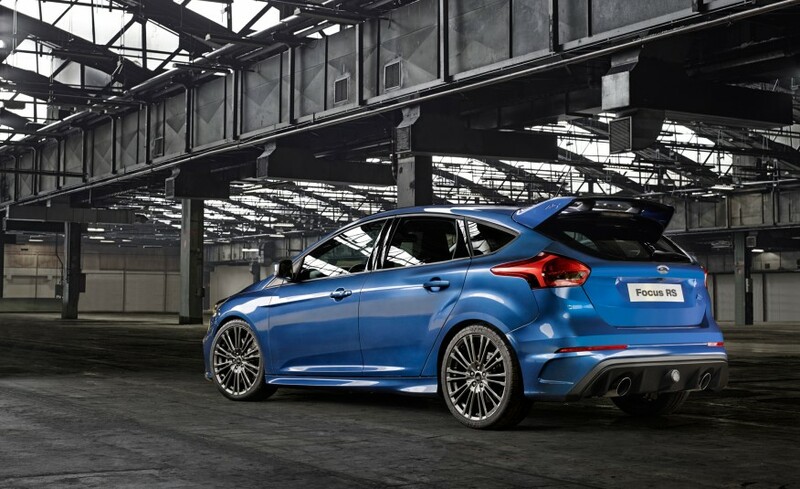 The RS will sit on Michelin Pilot Super Sport or Pilot Sport Cups for the track enthusiast. Either way you go Michelin has designed the tires specifically for the RS. All told the RS will grip, grip and grip some more. Ford is expecting more than 1.0g on the skid pad. Unless you poke the car with a stick, then it will drift. For that reason alone, expect this car to vault straight to the top of the ShiftingLanes.com Hot Hatch list. The exterior is properly loud, flared wheel arches, ginormous wing, huge grill, big wheels are all present and correct. Ford even says the bodywork creates real downforce. As for the interior, think RS badges, Recaro Seats etc. So the Focus RS back and better than ever. And if Ford’s history is any indication only Europeans will get the opportunity to enjoy it. Sure they shipped some over for the motoring press to drive. But even before the ink was dry on the review, the cars were back on their way to Euroland. Well, the best news about this entire thing is the new RS is USA bound. Oh yes, for the first time the Focus RS will be coming stateside. Beware STI and Golf R owners. The RS is coming and it’s coming for blood. Now sit back and enjoy the RS in the hands of Ken Block doing what Ken Block does.